Job hunting while you’re employed is a great way to advance your career and explore new opportunities. But your answer to, “why are you looking to leave your current job?” can make or break your job interview, and be the difference between getting a job offer and not hearing back from the employer. So I’m going to share my favorite method to explain why you want to leave your current job and take a new position, based on what I’ve seen works best during my time as a Recruiter. Hiring managers do not want to hire someone who does this, and you don’t want to sound like you’re too eager to leave your current job anyway. You have a big advantage if you’re job hunting while employed. Companies will want you more, and they know they need to put in more effort to attract you (since you already have a job that you’re safe/secure in). So use this to your advantage when answering questions about why you want to leave your job right now, and don’t badmouth or make it sound like you dislike your job right now. What do you hope to gain or get MORE of in this job transition? It could be a variety of things. But pick one or two things that you really want to do more of… and make sure they’re things that this job offers. But if you do this correctly, it will show them that you’re not desperate and that you’re looking for the RIGHT fit, not just for any job that’ll take you. That’s a GREAT way to position yourself as a top candidate and someone they should hire. If you feel it’s appropriate, you can also talk about how you’re grateful for what you’ve learned in your current job. Or talk about how you’ve built great skills there, but it’s simply time for something new. “I’ve learned a lot here and it’s been great. I just feel it’s time for a move because I want more of an opportunity to do ____”. That’s one way to begin an answer to the question of why you want to leave your current job. “I’ve learned a lot in this role, but after 2 years, I feel I’m ready for ____”. “I’ve enjoyed this position a lot over the past 3 years. I just feel that in order to grow my career further, I need to expose myself to new challenges, and your company caught my attention because ____”. One word of warning: Be aware that if you say you want more of an opportunity to do something, the interviewer will ask if you’ve tried to get that in your current job. So, be ready for that. Maybe your job bores you to death. There’s no human interaction, and you just sit in front of a computer entering data into spreadsheets. Not fun, right? So you want a more exciting job. These two example interview answers assume you’re actively searching for jobs and really trying to get out of your current job (even though you’re not going to say that). So, to recap, it’s okay to say you’re actively searching. It’s great to name a few things that you’d like more of in your next job – especially if you’re sure that this new job would offer those things! But never sound like you’re miserable in your current job. It’s not going to help you get job offers, plain and simple. Let’s look at one more example now. What if you’re not actively job searching AT ALL. Maybe a Recruiter called you, etc. Here’s a good example for that scenario. If you weren’t searching, but you got on the phone with a recruiter and they convinced you to take an interview with the hiring manager, the hiring manager still might ask why you want to leave your current job. So you need to be ready with great answers for the phone interview when they ask questions about this topic. If you just say that and stop, they’ll be worried you’re not serious about considering their job, and then they will NOT offer you the position. It’s okay if you’re on the fence and not sure you’d accept their job anyway, but you want to get the job offer, right? There’s no point on getting on the phone and immediately eliminating yourself from contention. So you want to make it clear that you’re not in an active search, but then name one or two things that might attract you to a new position and make it worthwhile to leave your current job. This is a great answer because you’re explaining your situation clearly and directly, while also showing them why you want their job or what might convince you to take it. You’re also ending your answer by asking a question of your own. Great tactic to set yourself apart in the interview! The times when you have a job can be the best times to look for jobs, because you’ll be more confident and have more bargaining-power/leverage. 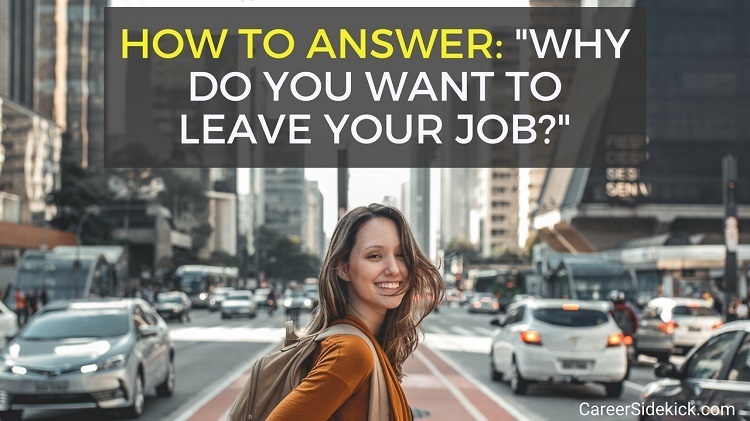 Now you know how to answer questions like, “why are you looking to leave your current job?” or, “why do you want to leave your job?”. If you follow these steps, you’ll impress the interviewer and boost your chances of getting the job offer.